My sermon from the 18th Sunday after Pentecost (September 23, 2018) on Mark 9:30-37. Listen to the recording at the bottom of the page or read my manuscript below. Imagine standing on a small ledge, 50 feet above the earth. On your right and on your left is just air. You feel safe because you’re wearing a harness and there’s someone below holding a blue safety rope. 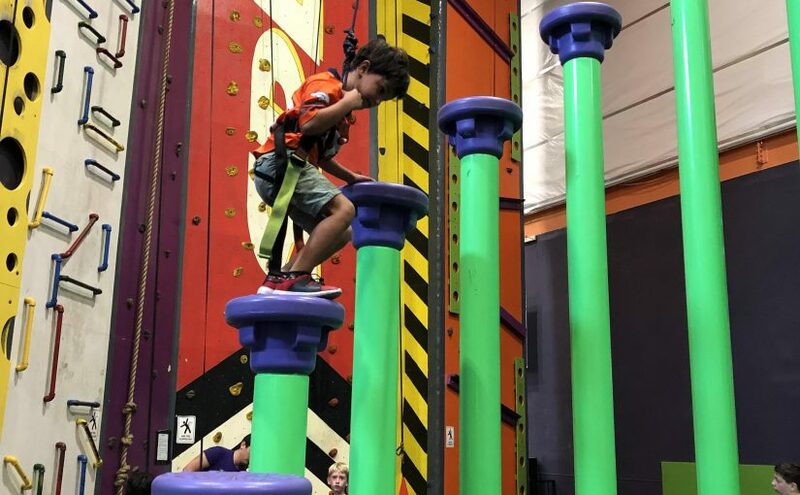 You’re on that ledge because you’ve embraced your inner Spider-man, climbing to the top of a thin rock wall inside a vast indoor playspace devoted to wall climbing, obstacle courses, and everything needed to become an American Ninja Warrior. Ten feet in front of you is a large red punching bag, hanging in the air. All you need to do to complete this obstacle is to jump on that bag, wrapping your arms and legs around it. Now, you know you’re safe. And you’ve spent the entire day doing things you’ve never done before. You’re feeling great. So you stare at that bag. And then you look down. And then you stare at that bag once more. All you need to do is jump. But then you hear it – a chorus of fifteen six year olds at a birthday party shouting “jump!” It’s sort of impossible to do great things when a bunch of little kids, their faces covered in pizza and cake, are shouting at you to “jump.” I felt bad for that teenager up on that ledge who was trying to do something great. But they recognized that their situation changed. So they sat down, letting their feet dangle over the edge. And after a minute or a two, they slid off – letting the safety rope control their descent down to earth. In our reading from the gospel according to Mark, we have disciples and a savior who do very silly things. Jesus is wandering through Galilee, the northern part of ancient Israel. He’s trying to be discreet – so he doesn’t feed a thousand people or cast out any demons. Instead, he focuses on his disciples – telling them the next part of his story. The disciples don’t understand what Jesus is talking about but, as we heard last week, their confusion is completely understandable. Peter knew that Jesus is the Messiah – the one who would turn the world upside down. But Peter and everyone else assumed that this would only happen when Jesus used our tools of war and violence to establish God’s kingdom. Even after Jesus said, “that’s not how this works,” the disciples still didn’t get it. But they were listening because when Jesus told them, again, about his death on the Cross, the disciples decided to change the subject. Now, on the surface, arguing about who is the greatest is pretty silly. The disciples are literally walking around with the guy who can feed thousands of people with the crumbs in his pockets. And their acting like kids, arguing about who is Jesus’ best friend. We can, however, give the disciples a bit of pass on their behavior because, just a few chapters earlier, they had experienced Jesus’ power when Jesus sent them to preach, teach, and heal in villages all over Galilee and Judea. Each one of them had been like Jesus, getting a little taste of the unlimited things Jesus could do. And that, I think, gave them a confidence that God was going to overcome with power the pain, suffering, and violence all around them. They imagined that this overcoming of the world was just the beginning of what Jesus was about to do. So, I think, as they talked about who was the greatest, they told stories of the sermons they preached, the healings they participated in, and bragged about how many people heard them in synagogues, homes, and in marketplaces. And since they knew their Bible, they imagined themselves to be the heads of a re-established Israelite kingdom. The 12 tribes of ancient Israel would return, after having been reduced to only 2 over 700 years before they born. The disciples didn’t see themselves as only students of Jesus. They also imagined themselves to be his future generals. It’s silly to be arguing about who is the greatest when God is literally in the room but it’s normal to cling to whatever power we see – so that we can overcome our reality and receive its benefits today and for years to come. So Jesus responded to a very human but very silly argument with a silly maneuver of his own. He invited a child to be with him and the rest of his disciples. Now we might not realize what Jesus is doing here because we spend a lot of time and energy trying to bring kids to Jesus. We’ve invested in our Sunday school, Confirmation, and our new multi-church high school youth group. I’m personally grateful when kids are here in worship because, as baptized children of God, Jesus says they belong here, just like I do. And any homeowner in our area can look at their property tax bill and see how much we invest in childhood – through education, sport leagues, music lessons, and giving kids experiences so that they can live a life we think they deserve. But in Jesus’ time, there wasn’t a childhood. Once kids were old enough to help their parents on the farm or in the home, that’s what they did. We have ancient statues of four year olds holding mining equipment because kids worked. But kids were still kids. They were still growing and learning and being themselves. They needed to be taken care of. So, in Jesus’ day, being a kid wasn’t something anyone really admired. No one wanted to find their inner child or spend time chasing their childhood dreams because a child, back then, was seen as someone less than being an adult. In the social hierarchy of Jesus’ day, this meant children were at the bottom. And until kids grew up, they weren’t worth much. They were marginalized, vulnerable, and powerless. The disciples imagined themselves to be Jesus’ generals because they were hanging out with the ultimate power in the universe. And in response, that power took the powerless and said this is who God chooses to be with. I’m pretty sure the disciples would struggle to understand why we celebrate the birthdays of 6 year olds and why we have whole event centers filled with obstacle courses and climbing walls so that hordes of little kids can shout “jump” while they’re eating pizza and birthday cake. But I think they would understand what it’s like to feel as if they are on the cusp of greatness only to then slide down into reality. Every sermon they preached and healing they participated in, gave the disciples a personal confidence that they were heading towards something great. They saw themselves as climbing up a rock wall of faith that would let them overcome everything. Yet they struggled to see how, through the Cross and through the resurrection, God was about to transform it all. There was nothing the disciples could do to become the greatest with God because the greatness of God had already decided that they were worth living and dying and rising for. As the baptized, as the faithful, as the ones who follow Jesus – every time we worship, pray, read our bible, and serve in our church – we hope that this kind of experience will grow our relationship with Christ so that we can become a little more great in our faith. Yet the God we try to be great for is a God who is already here, in our midst, loving and serving and being great to us because that’s who God is. In Christ, there’s nothing we can do to be greater with God. We can’t climb that wall of faith because Jesus has already come down. Instead, we can only live God’s greatness out by sometimes taking a seat, letting our feet dangle over the edge, and then sliding down to live and love and serve each other and our neighbors just like Jesus did.